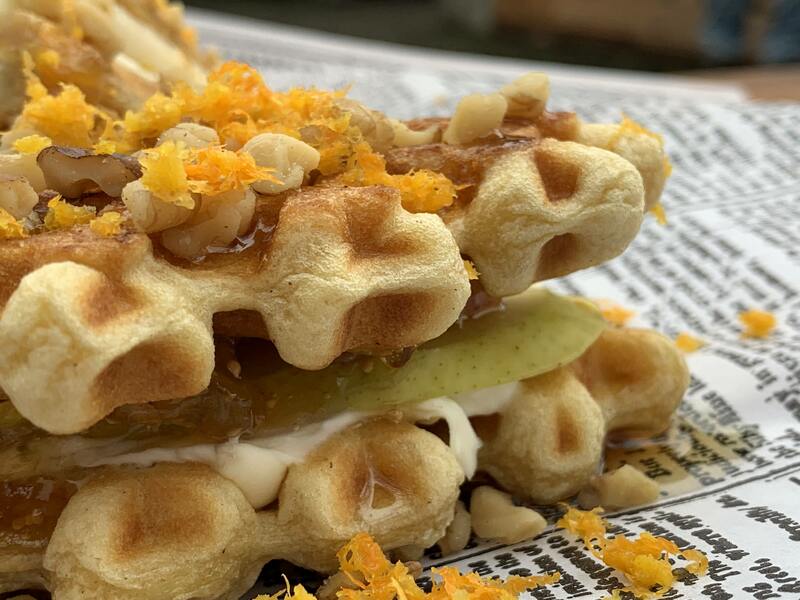 Here in Portland, Oregon we have a number of wonderful Waffle establishments that I can’t say enough about including – Gigi’s Café, Smakken Waffle Sandwiches Food Cart, Off the Waffle, and Puffle Waffle. You can add The Portland Press to that list. 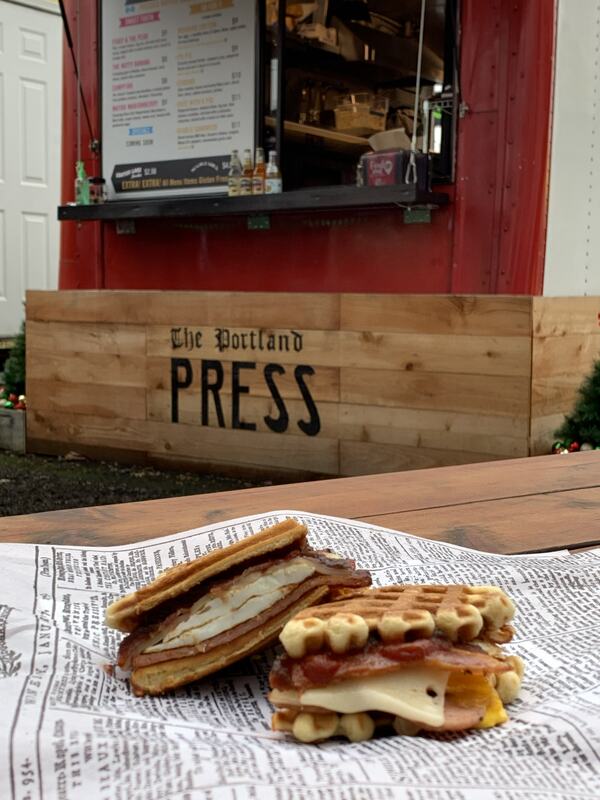 The Portland Press Food Cart serves “Pressed Waffle Sandwiches” and they are located in Portland’s Sellwood neighborhood at the Piknik Park Food Cart Pod. Brothers Aaron and Brandon Appel grew up Philadelphia, Pennsylvania. 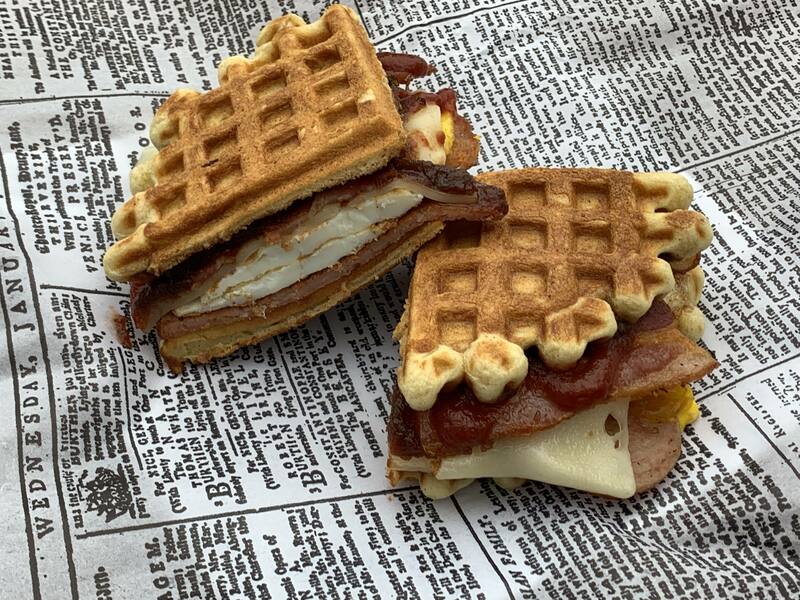 Aaron studied journalism at Temple University before heading out to Los Angeles where he worked in the Food Truck community. 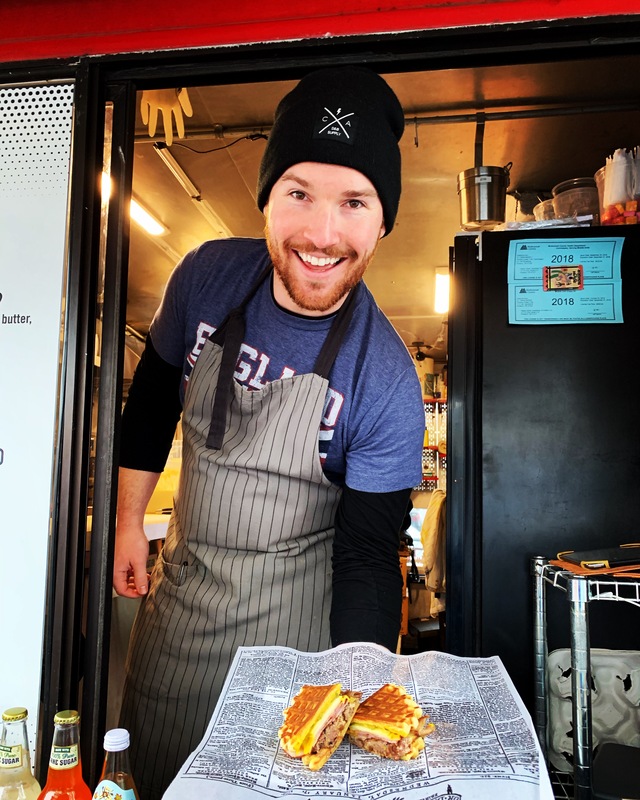 Aaron moved to Portland in October of 2017, and he came to Portland for the express purpose of opening a Food Cart and having a culinary business of his own. 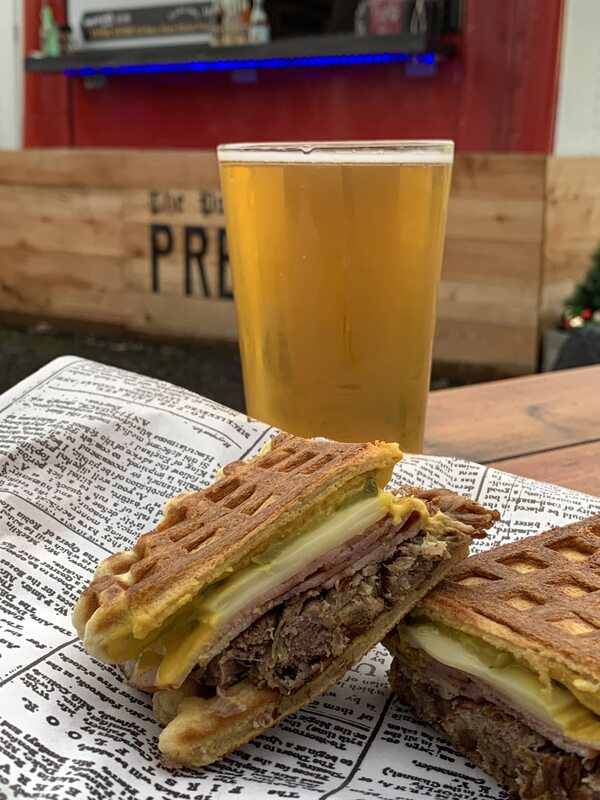 Brandon moved to Portland in the summer of 2018 to join his brother’s culinary endeavor. Prior to moving to Portland, Brandon had spent a number of years in Florida. While there he was self-employed – Brandon owned a local tour company that featured bars, and restaurants. 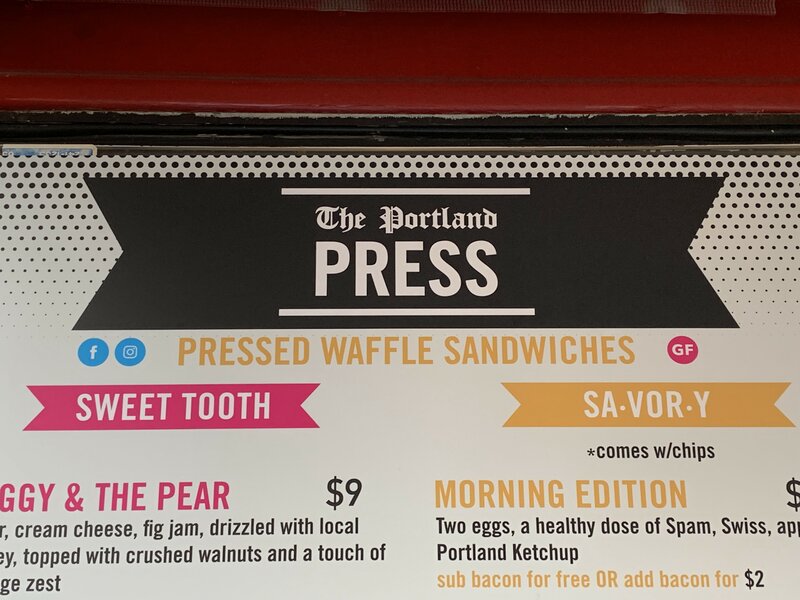 Aaron and Brandon opened the Portland Press in October of 2018, just a few months ago. Lastly – while she tried to stay in the background , I would bet my bottom dollar that The Portland Press would not be where it is today, were it not for Hillary Darling. She is the rose between the two thorns in the photo above. 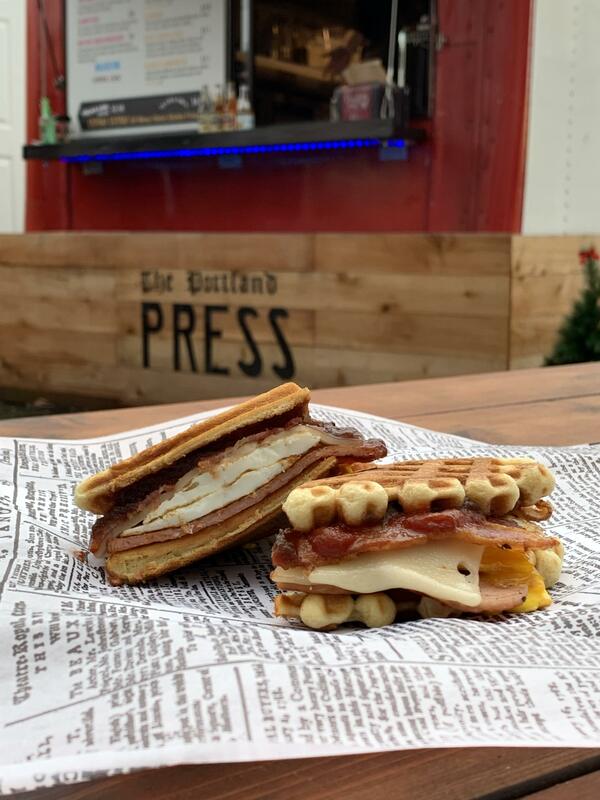 When you visit the culinary treasure that is the Portland Press you will be able to enjoy wonderful Pressed Waffle Sandwiches – both savory and sweet! 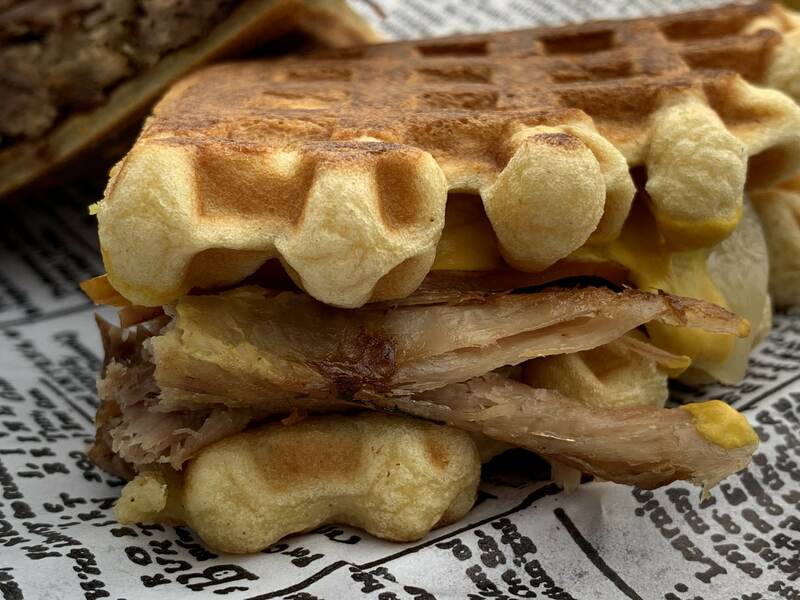 They make their own waffles right in there in the cart, create the sandwiches to order, and then they press them with a Lodge cast iron press. 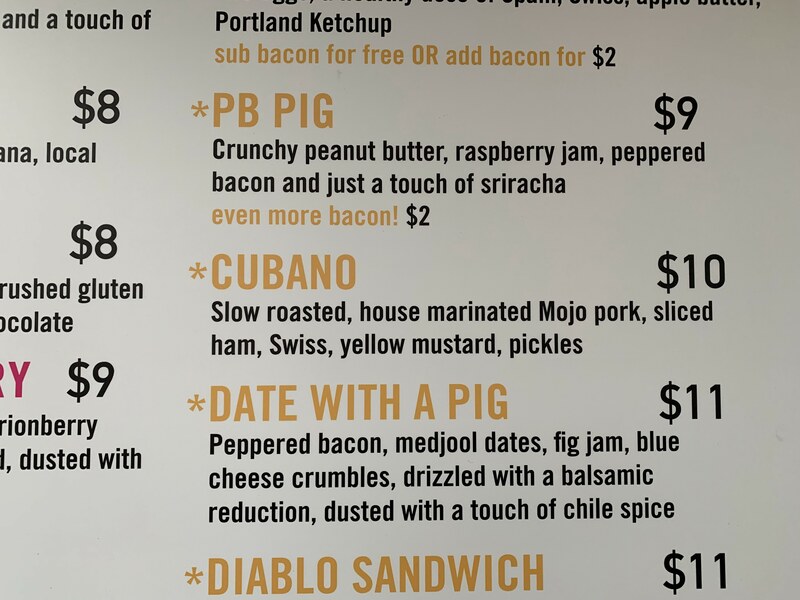 During my visit to this great Portland Food Cart I enjoyed 5 of their dishes – the Morning Edition, the Cubano, the Date with a Pig, the Mayor Marionberry, and the Figgy & the Pear. Goodness! I can’t tell you how good the food is at The Portland Press! 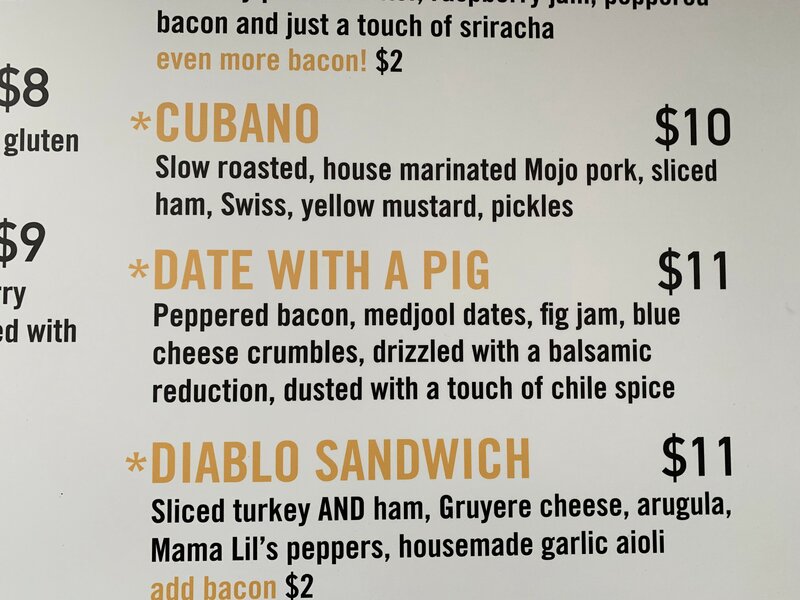 I cannot wait to go back and try the Diablo Sandwich with bacon added. I also want my sweetheart AKA KCisme AKA Diana Prince to try the Date with a Pig. She will love it! 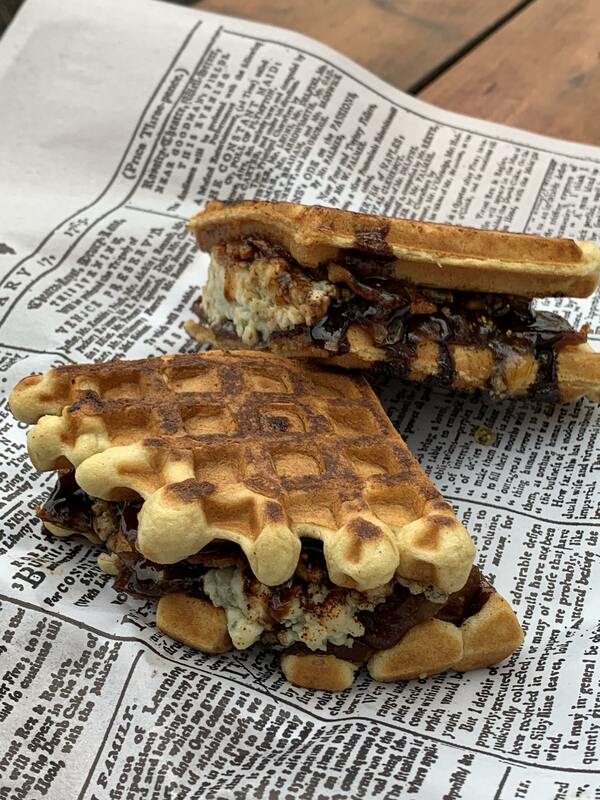 One note of caution – these pressed waffles sandwiches are quite a bit more filling than you might initially think! 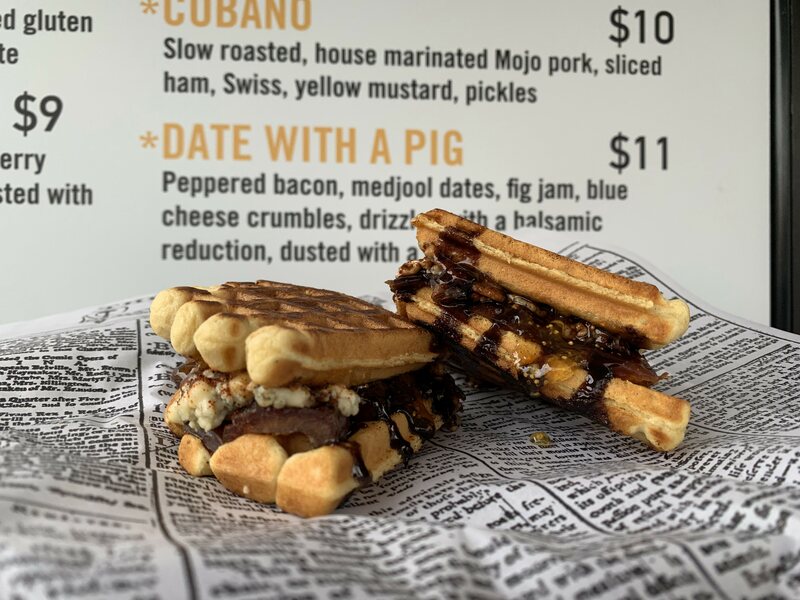 If you LOVE blue cheese as much as I do – get the Date with a Pig! 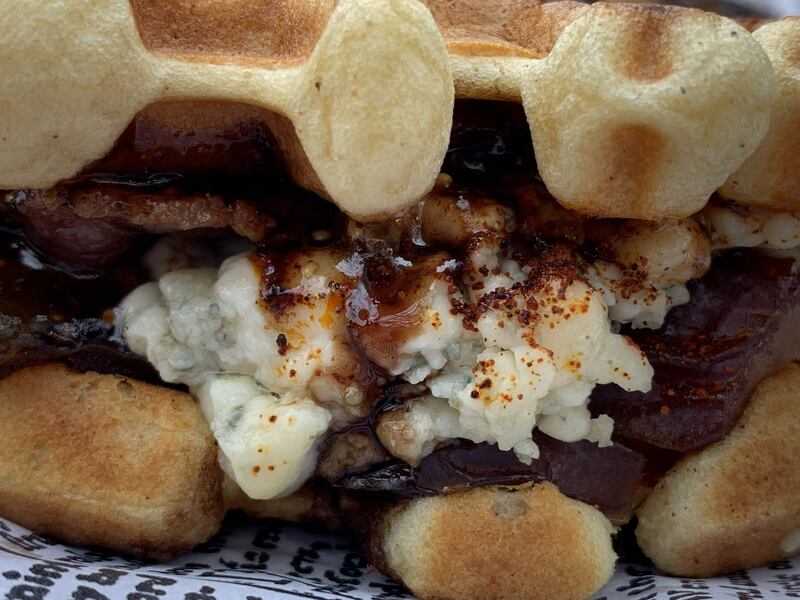 That sandwich has copious amounts of blue cheese on it!! 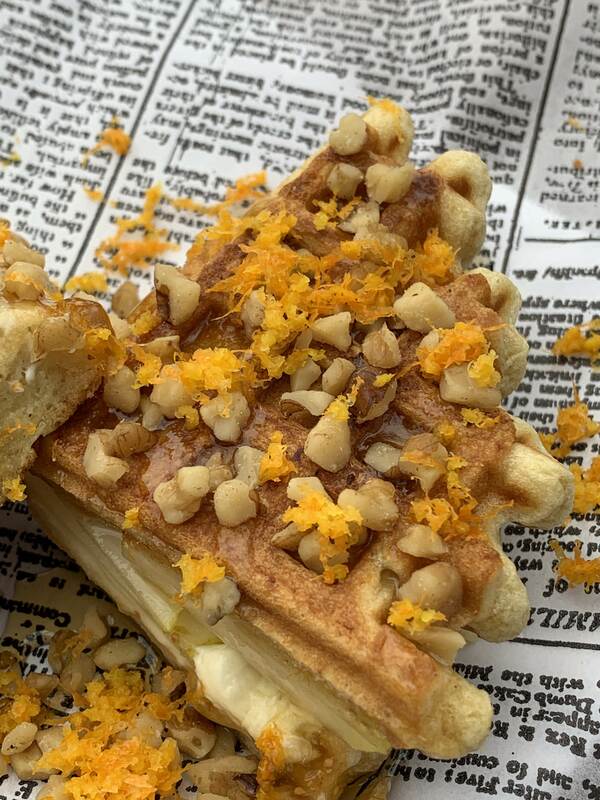 The orange zest on the Figgy and the Pear brings this whole fantastic dish together. 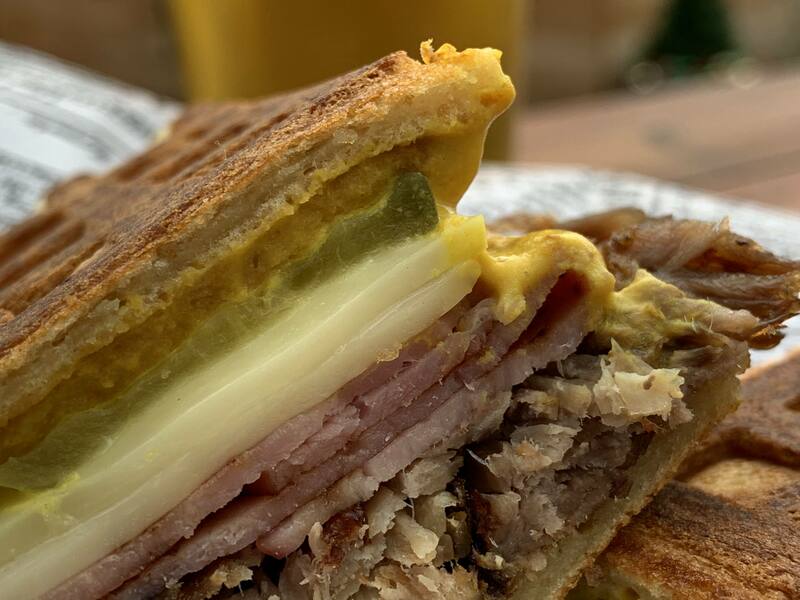 The Cubano pairs perfectly with a beer from the Dive Bar Beer Cart! 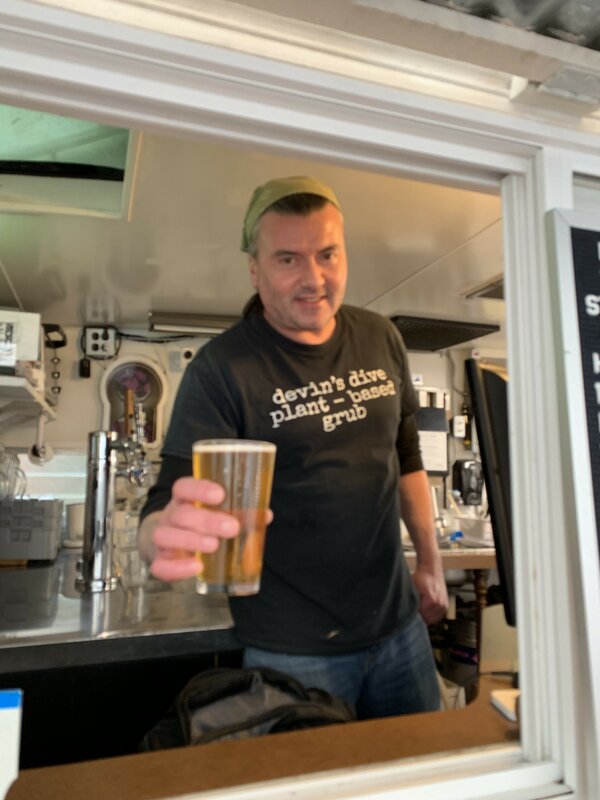 Kevin – who owns the Dive Bar Beer Cart, always has a great selection of craft beer on tap! 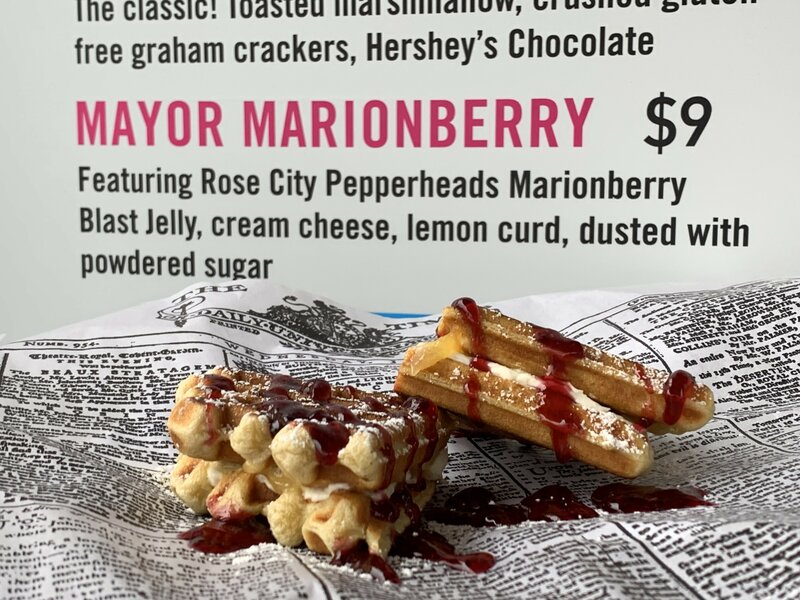 I keep thinking back to the Mayor Marionberry. 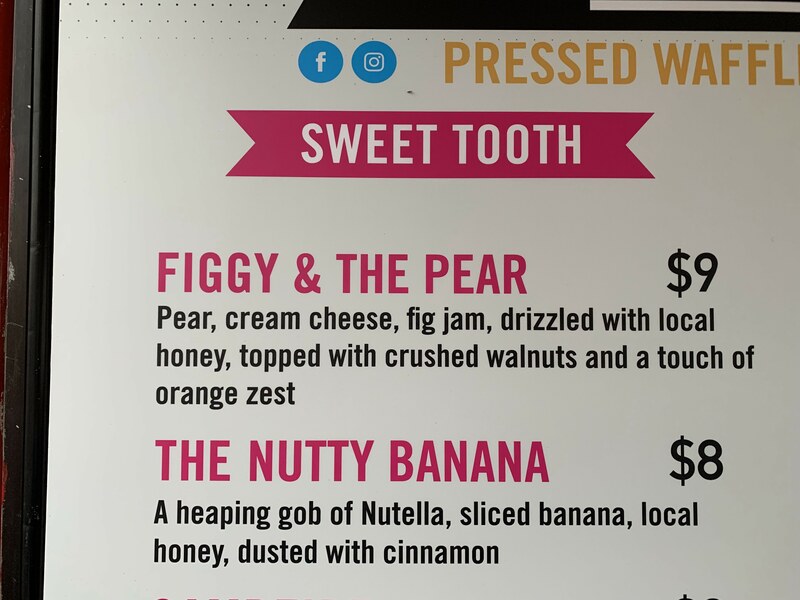 For my money it’s a great dessert item! 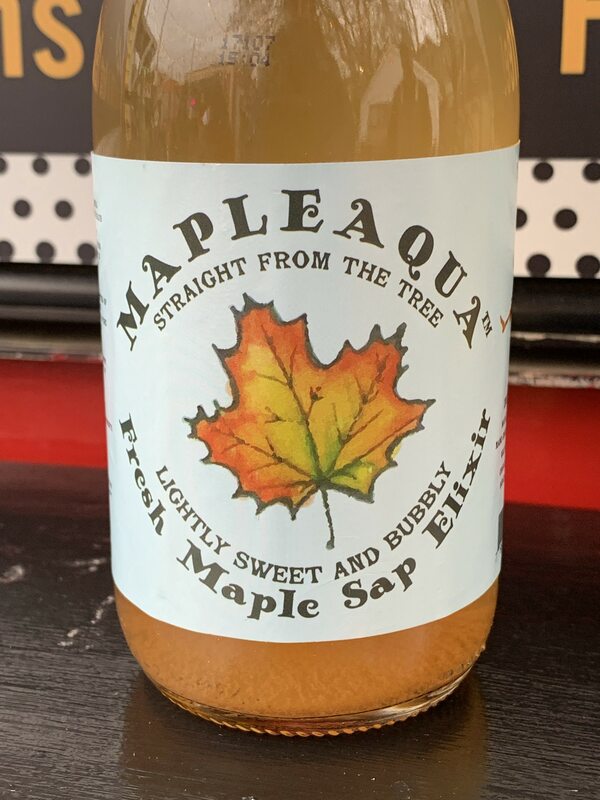 At The Portland Press you can buy yourself a bottle of Mapleaqua – a “Chaga + CBD + Yerba Mate Maple Sap Elixir” that appears to be made right here in Rhododendron, Oregon. 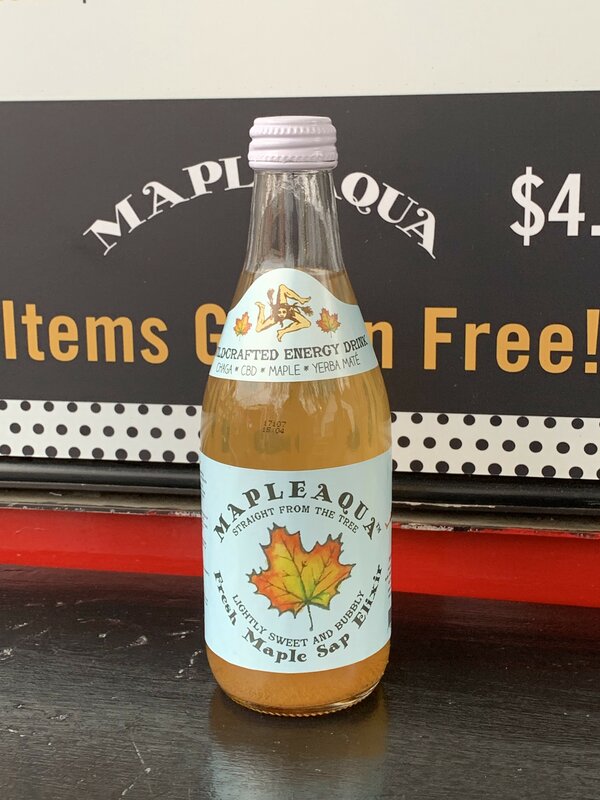 I am going to have find out more about this beverage. 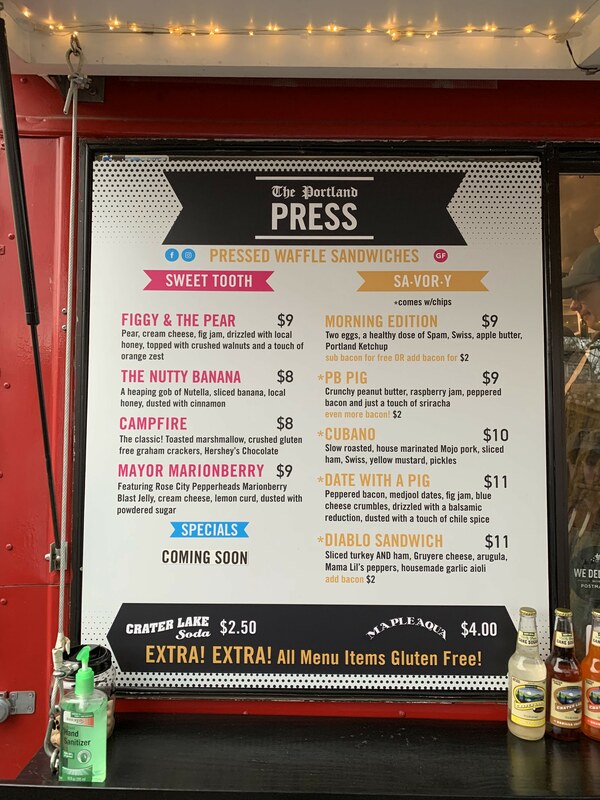 Lastly – the entire menu at The Portland Press Food Cart happens to be Gluten-Free. Don’t let that fact stop you from going there! 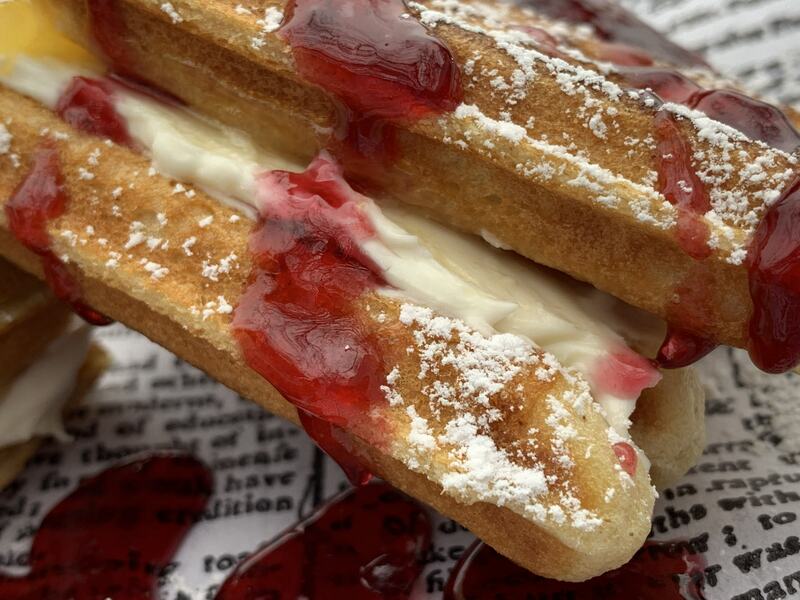 Go to This Food Cart! 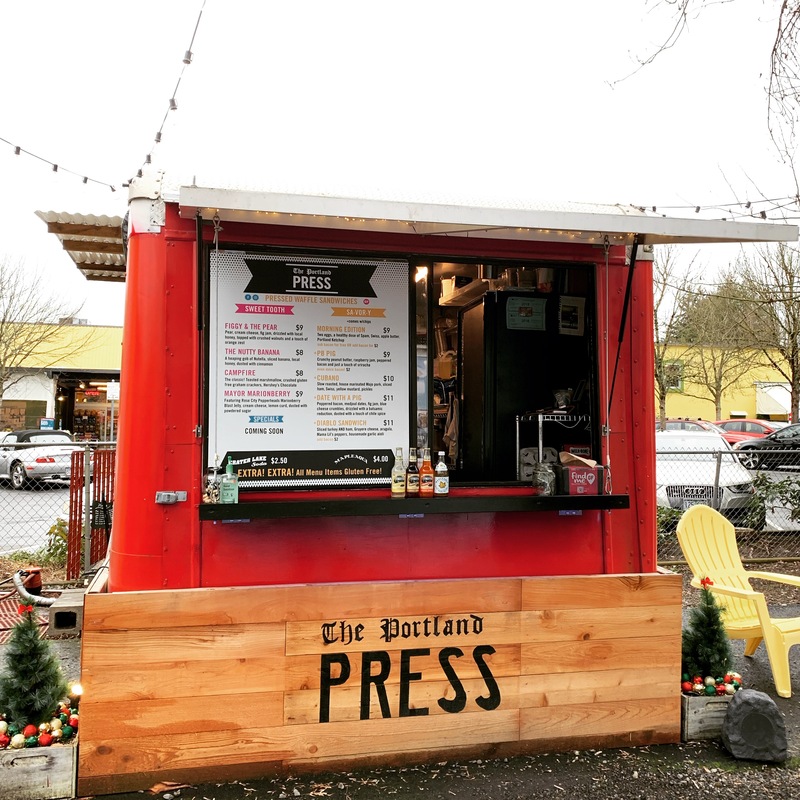 The Portland Press Food Cart is a Culinary Treasure and I recommend you visiting it as soon as you can! Below the “Follow” links is the short video I shot while I was at The Portland Press and quite a number of photos. 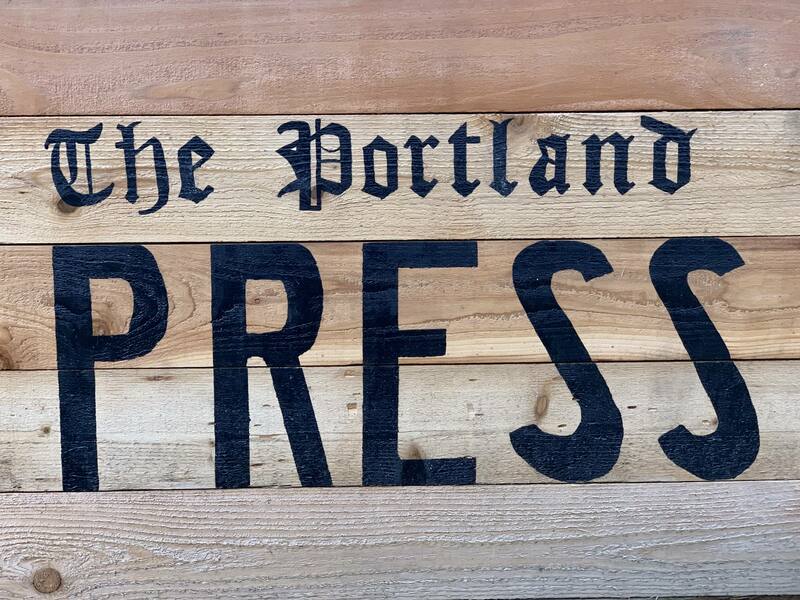 Below are quite a number of photos from my visit to The Portland Press! 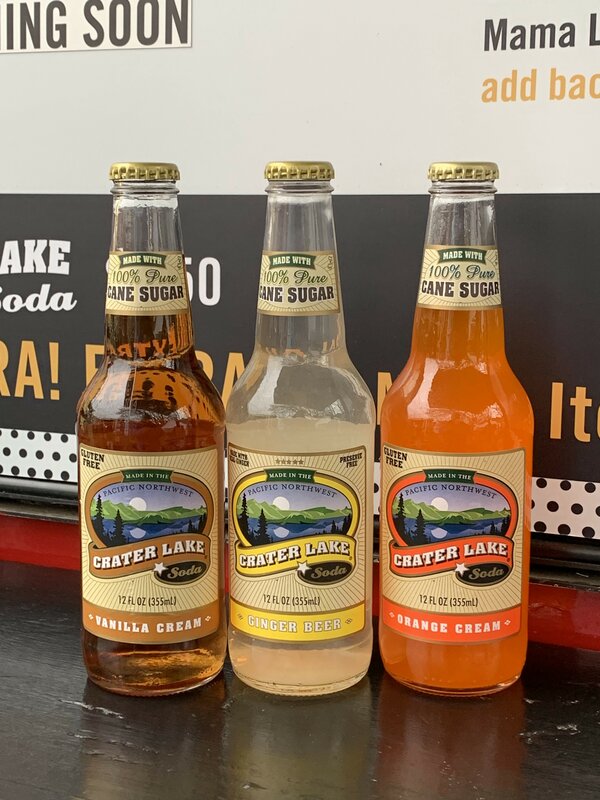 The first ever Crave The Coast Food Festival is happening Saturday September 29th, 2018 from Noon – 6 PM at the Port of Garibaldi event tent, overlooking Tillamook Bay. 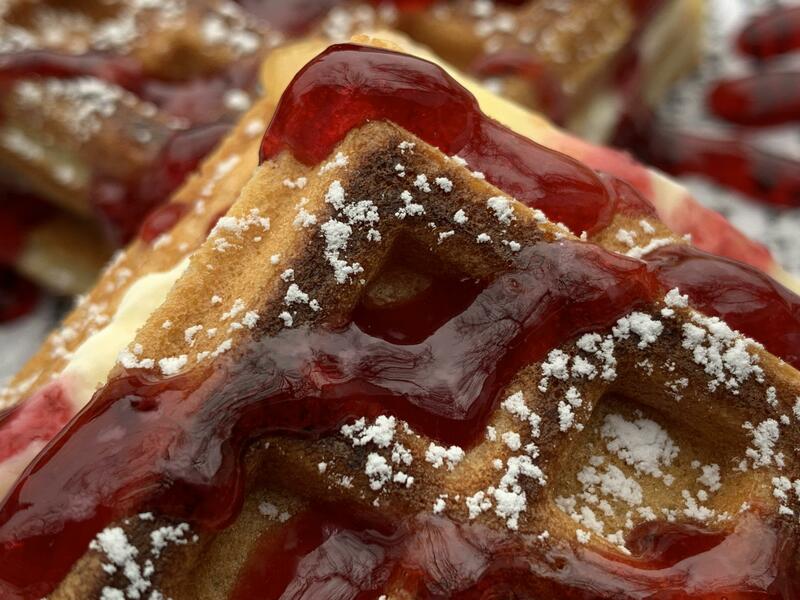 More than 20 local producers and exhibitors will be there. See below for the list of exhibitors. Tickets – $30 for Adults 21 and older, $20 Ages 20 and under, and ages 6 and under are free. This past weekend I had a number of fantastic adventures. One of my stops was for dinner at Portland’s own Doug Fir Lounge. While there I devoured their Deviled Eggs. Goodness! These Deviled Eggs will make you want to swear in all the right ways. Pimento Cheese, Horseradish and a Ham Chip – Now I know what goes into a near perfect deviled egg. 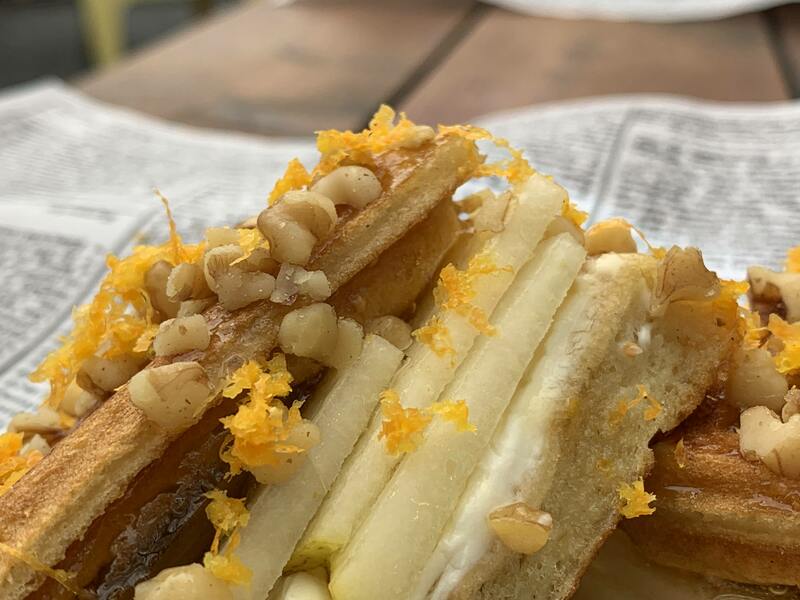 The Doug Fir is located at 830 E Burnside St, Portland, OR 97214 and you need to get there while these culinary delights are still on the menu! 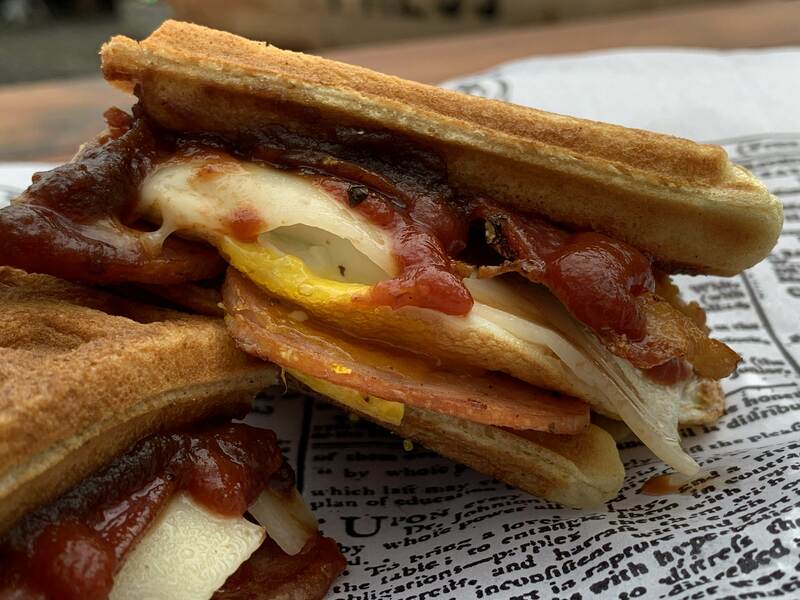 By the way – the Doug Fir is also a great place for breakfast. 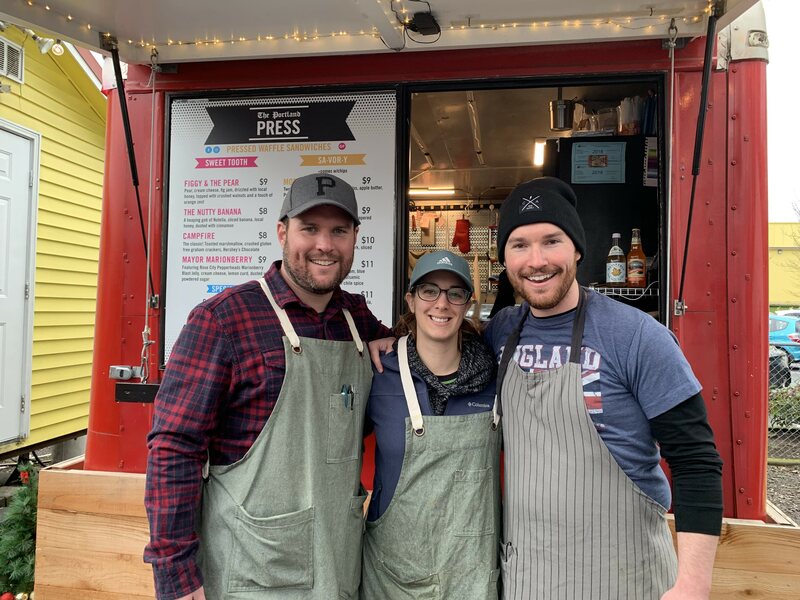 Amanda McCoy and her husband Rob moved to Portland answering the alluring call of the Food Cart and Brewer dreams that many hear, but not many have the courage to act on. 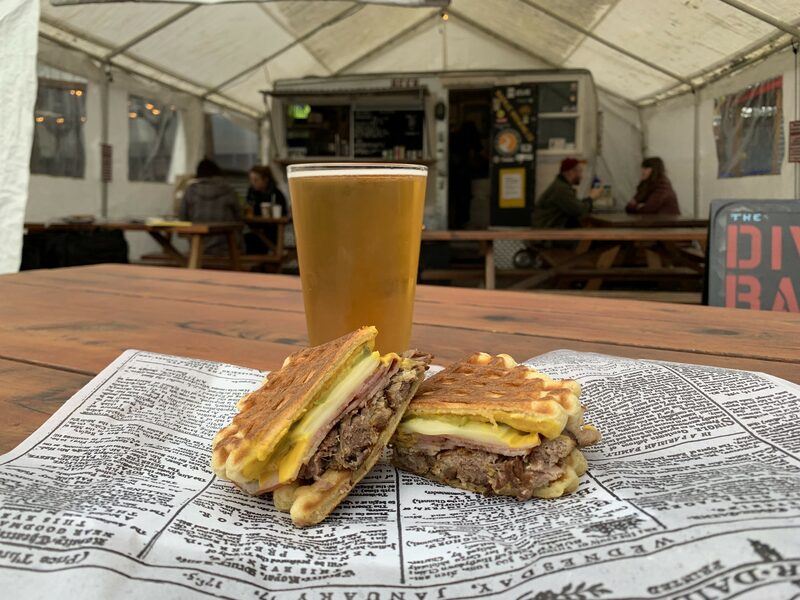 Amanda wanted to open a Food Cart and Rob wanted to work at a brewery here in Portland. 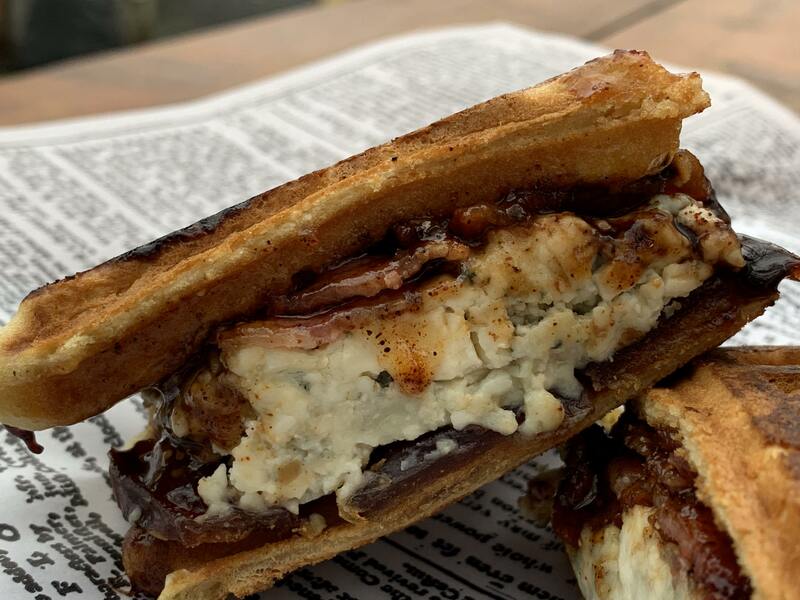 Last week Amanda’s Food Cart dreams came true when she opened PieCake at Carts on Foster. When Amada was a little girl her great aunt would make Amanda a culinary treat called “Wee Buns” and those “Wee Buns” inspired the PieCakes that Amanda crafts today. 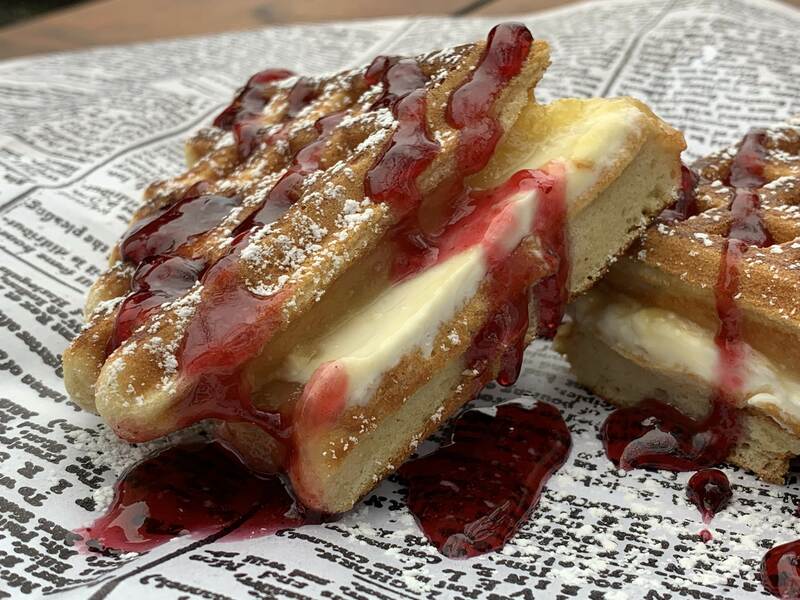 If you want to enjoy a PieCake for yourself, you can find the PieCake Food Cart at Carts on Foster at 52nd and Foster. One Fun Note – If you get your PieCake order “for here” the dish you will get your PieCake on a dish that was used at Amanda and Rob’s wedding. Following her wedding, Amanda kept the dishes so that she could use them at the food cart she dreamed of someday opening. 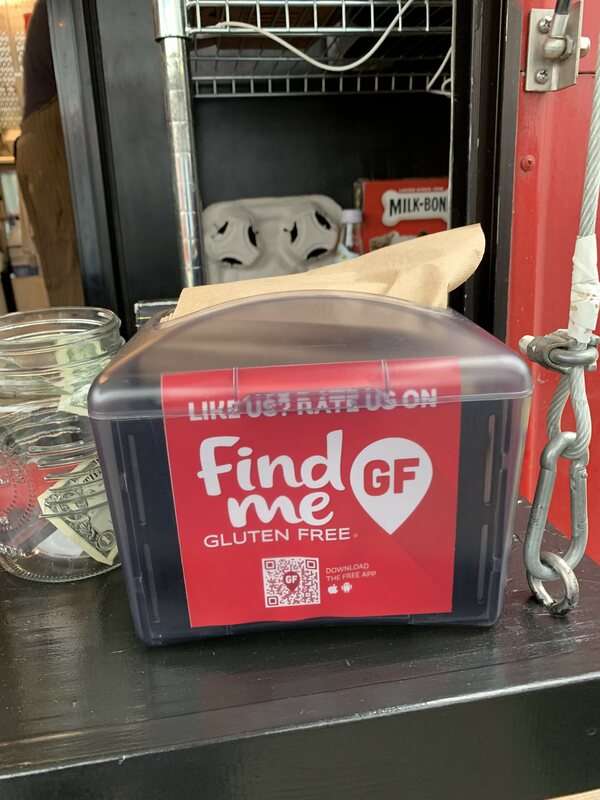 By the way, while I was at Amanda’s Food Cart working on this story, she happened to open the refrigerator and inside, amongst the baking items, were cans of Great Notion Juice Jr. That’s right Rob moved to Portland to work at a brewery here, and he is a brewer at Great Notion Brewing! Below are a few more photos from my visit to PieCake. While I was in Kauai this past March I created a terrific cocktail – Moloaa Mai Tai! This Mai Tai has Koloa Coconut Rum, Koloa Dark Rum, and POG! For those who don’t know POG is a magical beverage made up of Passionfruit juice, Orange juice and Guava juice – POG! By the way – while I was in Kauai I was lucky enough to record an “on the road” episode of the Portland Culinary Podcast with the good folks at Koloa Rum Co.
#1 Start with a few ice cubes in your glass, and add a generous pour of Koloa Coconut Rum. #2 Fill the glass with POG. #3 Add a float of Koloa Dark Rum. While we where in Kauai our lodging was on Moloaa Bay. we were a 5 minute walk from Moloaa Beach. It felt very fitting to name this magnificent beach after this magnificent beach. One fun note – in November of 1963 the pilot and first episode of Gilligan’s Island was filmed here. Goodness! Koloa Rum is sooo damn good! As I mentioned, I was lucky enough to record an “on the road” episode of the Portland Culinary Podcast while I was in Kauai. This episode was recorded at the distillery itself. Later that day we headed down to the Koloa Rum Company Store / Tasting Room and purchased a bottle of both the coconut rum and the dark rum. If you like coconut, you will love the Koloa Coconut Rum! Koloa Dark Rum is so rich and smooth I was adding to my coffee in the morning! My normal boundary to stuck with only gin before noon, but Koloa Dark Rum was so good in my coffee, that on this trip, I had to make an exception. “The Original Koloa Kauai Coconut Rum: Distilled, blended and bottled by Koloa Rum Company Kalaheo, Kauai, Hawaii 40% ABV/80 Proof. Koloa Coconut Rum is made from the mash of raw Cane Sugar, distilled in an impressive vintage 1210 gallon steam powered copper pot still and cut with filtered water from the ancient Mount Waialeale. The Rum is distilled 2 times at 160 – 180 ABV. Taste and Finish: The initial taste is quizzically dry, probably from the pleasant 80 proof that Koloa has kept the rum at, which then leads to the wonderful flavor of baby coconut flesh at the front of the palate. The spirit finishes with light toasted coconut and hints of fresh lime zest and the slightest bit of caramelized pineapple. The Original Koloa Kauai Dark Rum: Distilled, blended and bottled by Koloa Rum Company Kalaheo, Kauai, Hawaii. 40% ABV/80 Proof. Koloa Dark Rum is made from the mash of raw Cane Sugar, distilled in an impressive vintage 1210 gallon steam powered copper pot still and cut with filtered water from the ancient Mount Waialeale. I love Reverend Nat’s Tepache! I always make sure get myself a few bottles and I have a blast mixing it with all kind of other beverages! This year I was lucky enough to get a pre-release bottle of 2018 Reverend Nat’s Tepache and I had a lot of fun with it this year! Here are 7 Fantastic Ways You Can Enjoy Reverend Nat’s Tepache! #1 Straight. Just drink it straight. That’s allowed. #2 Mix if with a beer. I love Tepache mixed with Widmer Brothers Hefeweizen. #3 Mix it with Tequila. I love Tepache Mixed with Patron. #4 Mix it with sparkling wine and make a Tepache Mimosa! #5 Mix it with Rum. This year I mixed mine with Casa Magdalena Rum from House Spirits Distillery, and a little lime juice. #6 Mix it with POG! #7 Mix it with Rum, POG and Lime Juice! Goodness this was amazing! 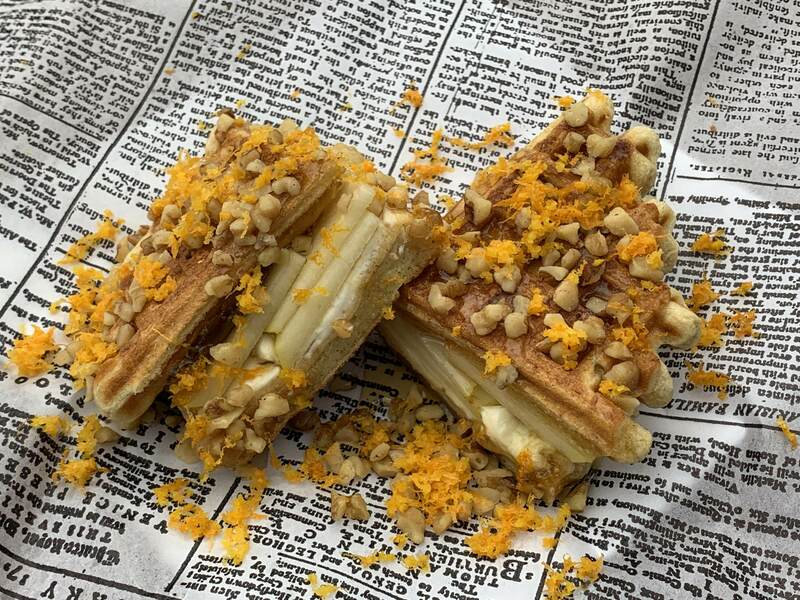 Nat West the Founder of Reverend Nat’s’ loves to make himself a Tepache Float with Tepache and Vanilla Ice Cream! I encourage you to seek out some Tepache for yourself and see what fun ways you can enjoy it! Tepache is a traditional fermented Mexican beverage that is generally made from the rind and the peel of pineapples. Tepache is often mixed with beer. Reverend Nat’s Hard Cider is a Portland based cider company that makes a fantastic Tepache. 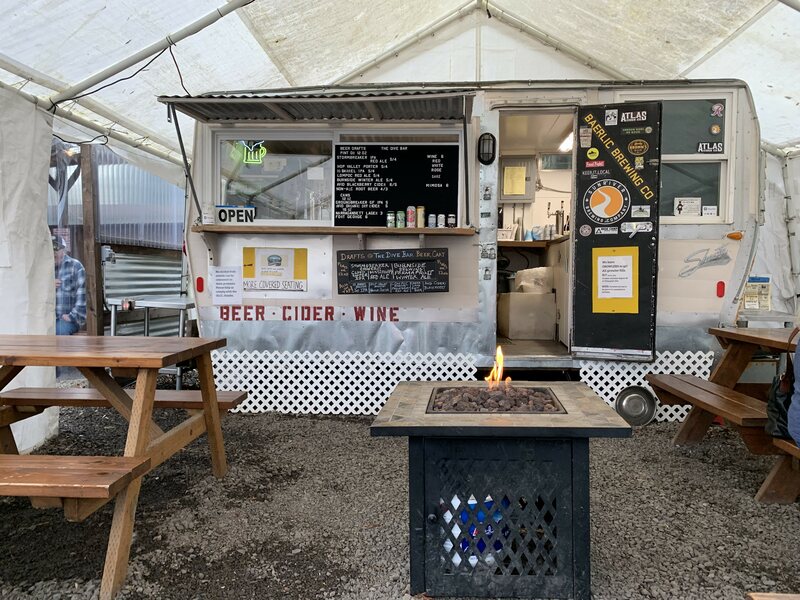 FYI – You read the Reverend Nat’s Hard Cider story in their Portland Beer Stories chapter. 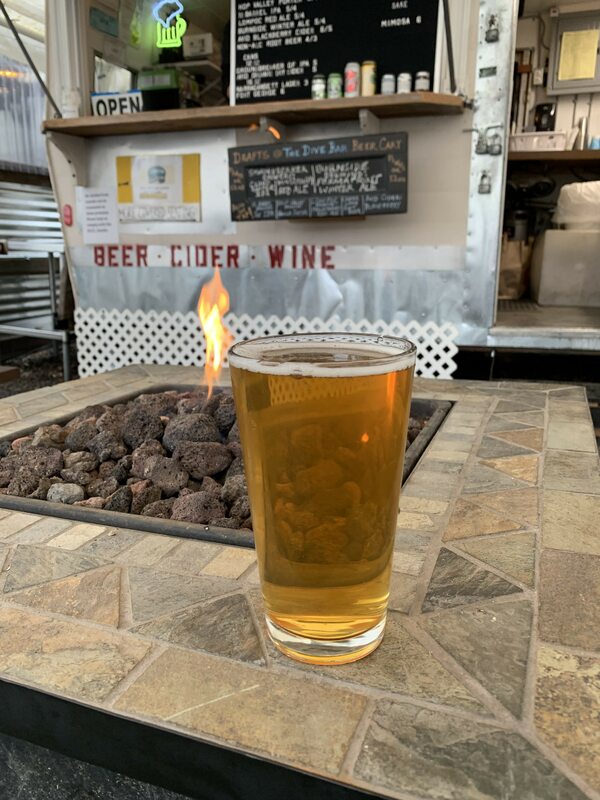 The Tepache that Reverend Nat makes is composed exclusively of pineapples sourced from his second cousin’s plantation in Costa Rica, piloncillo (a brown “sugar”) from the Mexican state of Michoacan, and a selection of spices. This year I was lucky enough to get a pre-release bottle of 2018 Reverend Nat’s Tepache! Why Does Reverend Nat’s Make Tepache? I encourage you to seek out some Tepache for yourself! 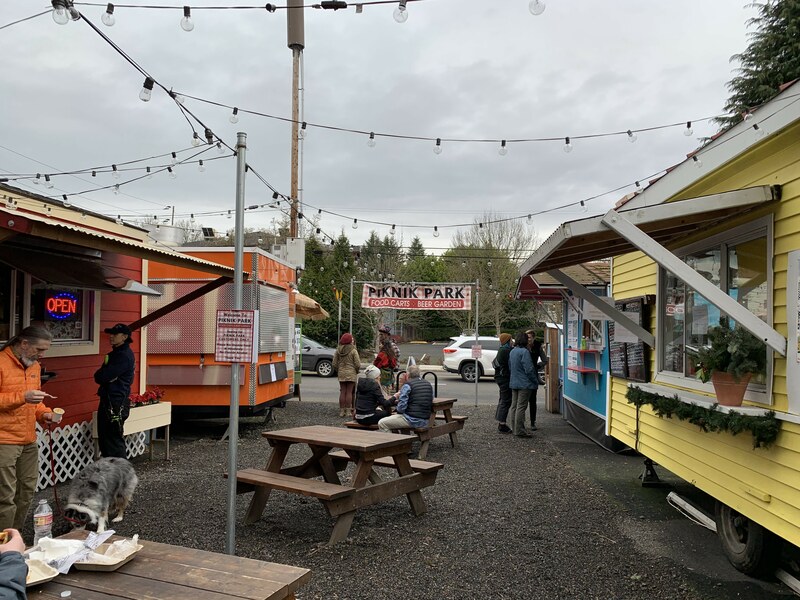 Sun Kim opened the FOMO Food Cart May 2017 and my first visit to this great Portland Food Cart was that very same month! The Fomo Food Cart specializes in Korean style fried chicken. 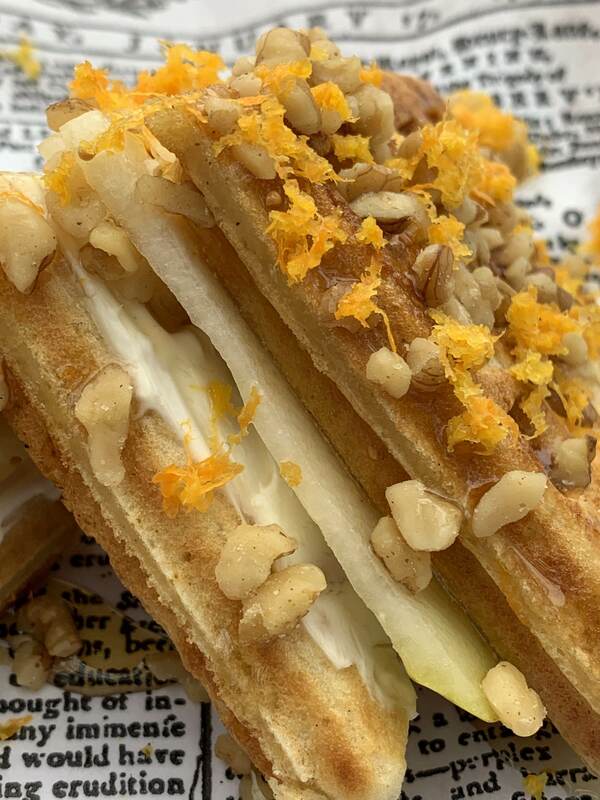 I have not yet been to Korea, however if the fried chicken there, tastes anything like the magnificent friend chicken that Sun is serving at FOMO, I cannot wait to get there! At FOMO you can get four different fried chicken bowls – Spicy Korean, Sweet Soy Garlic, Chicken Katsu & Turmeric Curry, and Southern Fried Chicken. The first three bowls come with rice, and the fourth one comes with mashed potatoes that will make your southern Grandma want to steal the recipe. I have to say – the fried pickles that come with each bowl are stupendous! I still want Sun to add those to the “A La Cart” (side dish) portion of his menu. 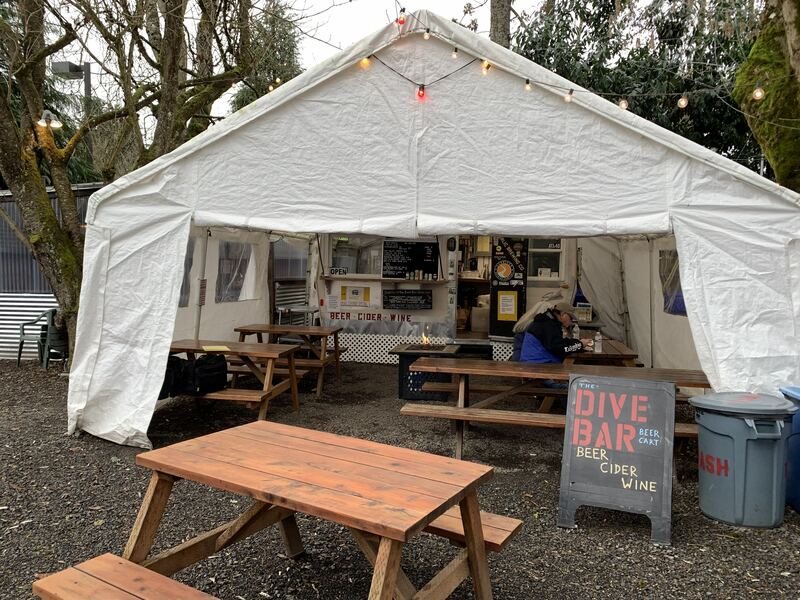 One Fun Note – Pod 28 is where two great Portland restaurants both got their start – Burrasca, and Guero No. 1 Tortas. 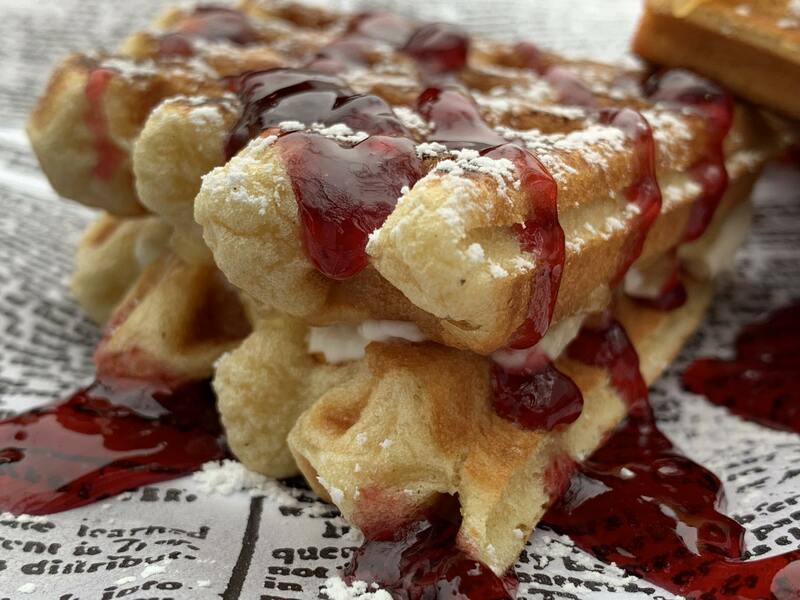 Below are some more photos of the wonderful food they have at FOMO. 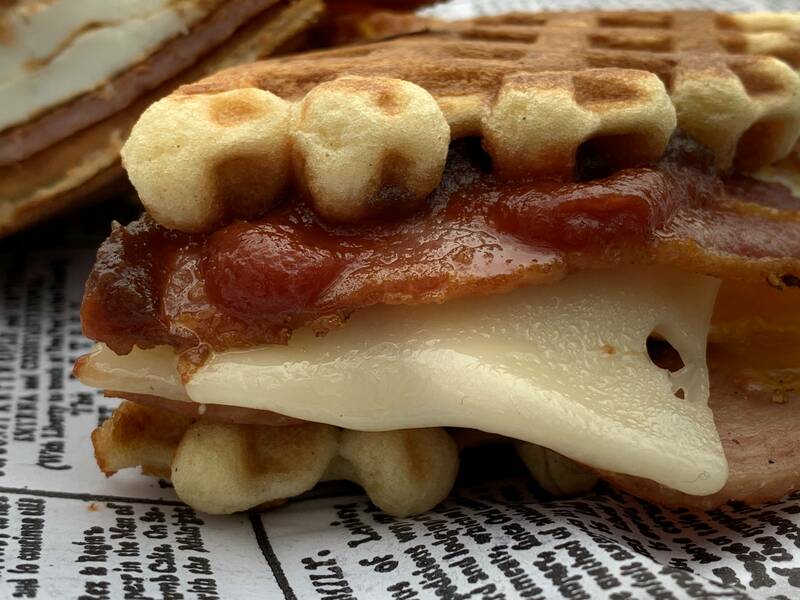 Needless to say — I highly recommend that you GO To This Food Cart! 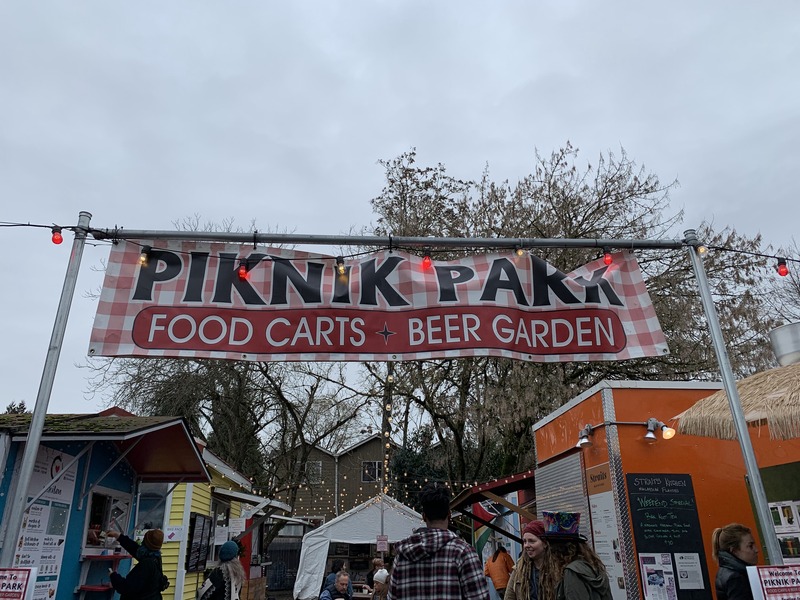 Four years ago in May of 2014, Marica and Justin opened the Paiku Food Cart with the hope of someday being able to make the leap to brick and mortar. 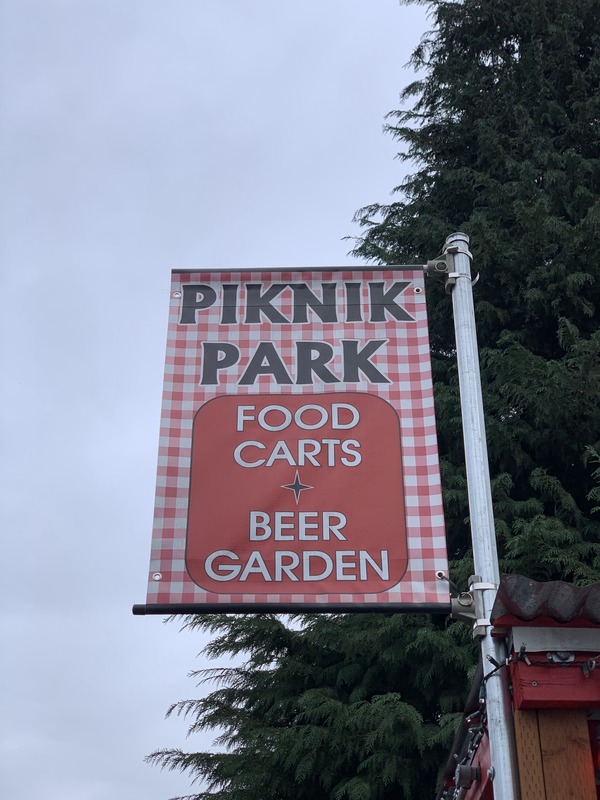 The last week of March 2018 Marica and Justin will be opening the Paiku Restaurant at 7425 N Leavitt Avenue Portland, Oregon 97203 in the St John’s neighborhood. 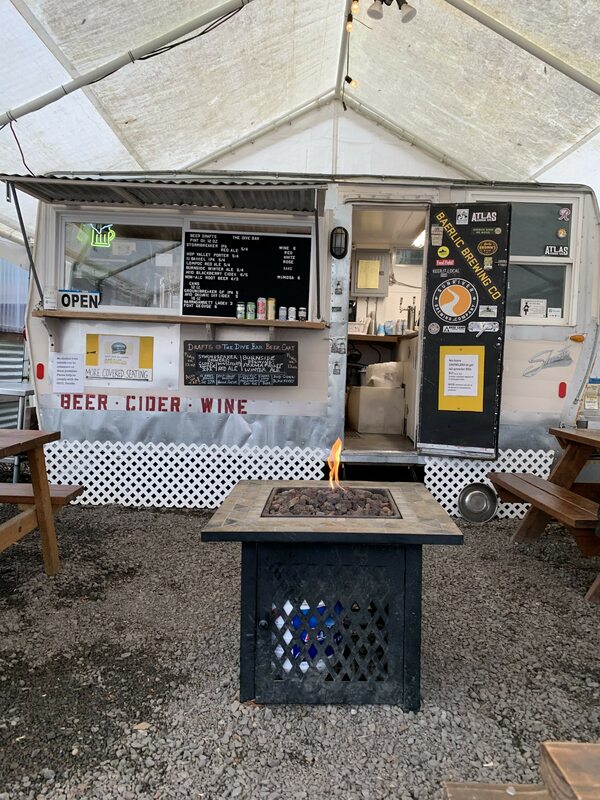 While Paiku was a Food Cart the menu primarily featured fantastic pies, both savory pies and sweet pies. 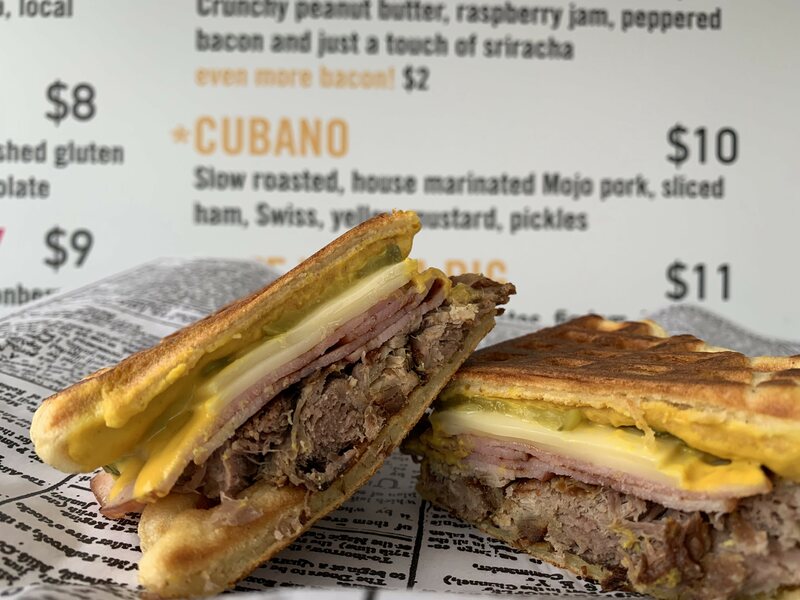 Making the move to brick and mortar will allow Justin and Marica to have an expanded breakfast menu as well as add soups and sandwiches to the menu! 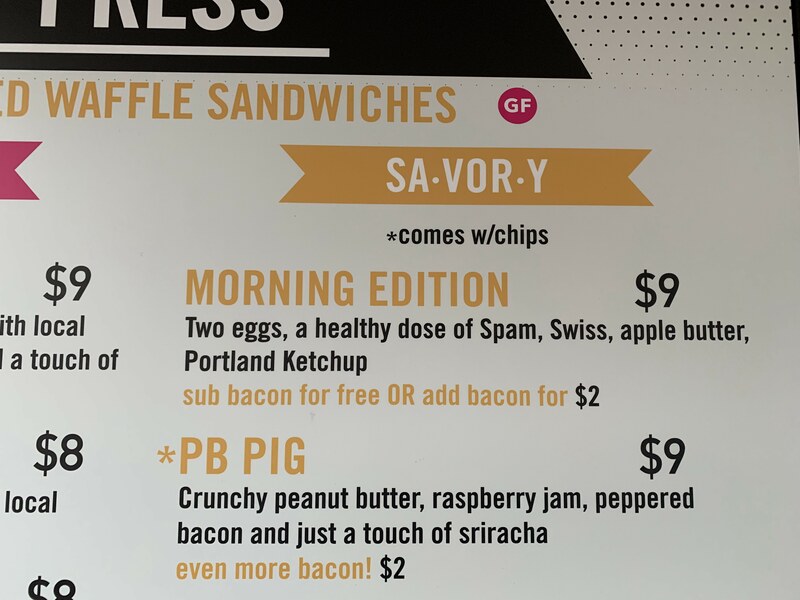 The expanded breakfast menu will feature a number of terrific hashs including a Bacon and Potato Hash made with Nueske’s bacon, a Wild Boar Chili Hash, a Vegan Hash and a Veggie Hash. 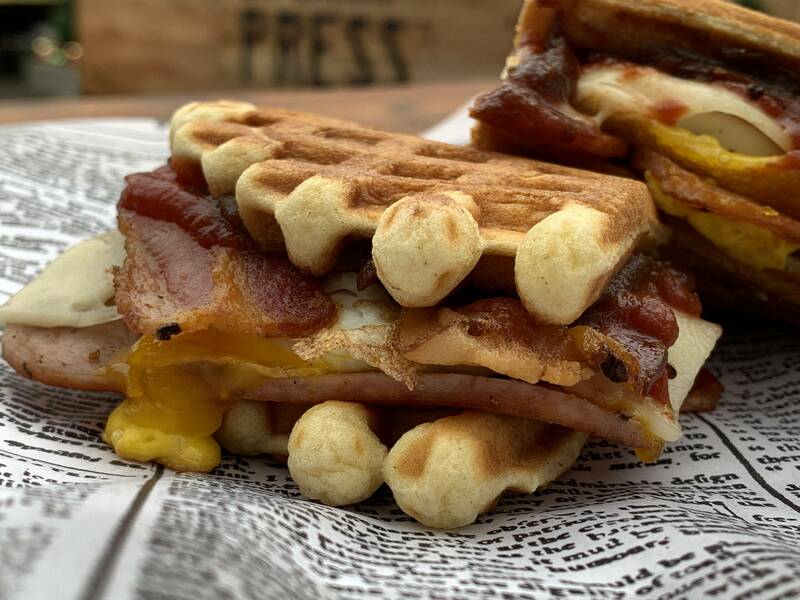 The breakfast menu will also include Biscuits and Gravy, and an Italian Omelette made with Olympia Provisions Sausage, Provolone, and Peppers. 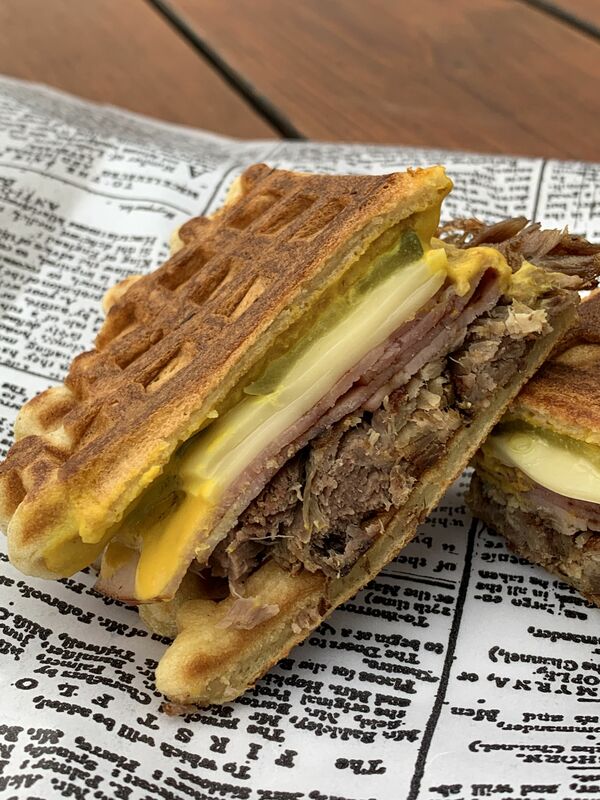 The lunch menu will include sandwiches such as a Venison Sandwich made slow simmered venison, cheese, and onions, a Curry Chicken Salad Sandwich, an Italian Sandwich made with Olympia Provisions soppressata, ham and cheese, a vegan sandwich, as well as veggie sandwich. Some of the savory pies they will be serving include a Chicken Pot Pie, a Venison Shepherd’s Pie, and a Vegan Pot Pie, Macaroni and Cheese Pie, Pastrami and Swiss Pie, Corned Beef Pie and a Easter Pie – an Italian egg pie made with Olympia Provisions soppressata, Olympia Provisions ham, provolone, mozzarella, Parmesan, and hard-boiled eggs. 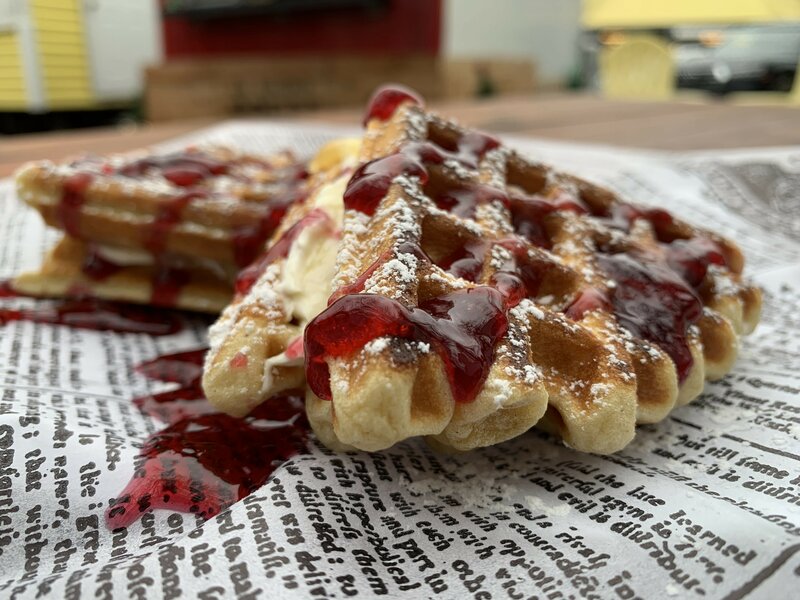 They will also have a number of specialty sweet pies that will be available every so often on the menu including – a Mango Blackberry Pie made with candied ginger and coconut, Chocolate Walnut Pie, Chocolate Pecan Pie, a variety of Cheesecake Pies including a Chocolate Cheesecake Pie, a Berry Cheesecake Pie, a Thai Iced Coffee Cheesecake Pie with a cardamom cream sauce. 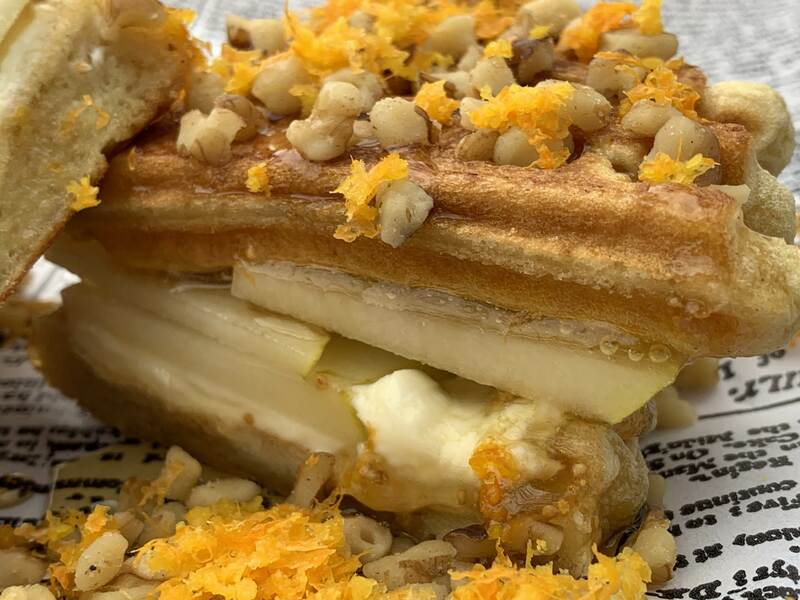 When the exact dates this week for Paiku’s First Day Open, and their forthcoming Grand Opening Celebration happening in April are announced, I will update this article.